The beauty of authentic Pilates lies in its subtle movements and fine-tuned adjustments. It is the small details of the authentic approach to teaching that give one results. Authentic Pilates Stillwater is dedicated to the preservation of the authentic teachings of Joseph Pilates. All instructors must undergo a minimum of 750 hours of training, observation and apprenticeship before receiving their Pilates certification. The authentic Pilates Method has been proven time and time again, for over 80 years. One-on-one instruction addressing your body's individual needs and goals. A semi-private session, sometimes called a duet, is when two people of equal abilities and similar needs work along side one another with one instructor. A mat class is a group class working with floor exercises of the Pilates system. 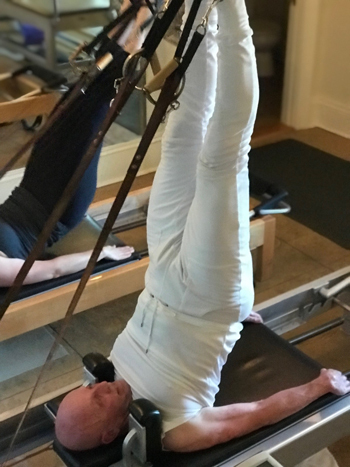 The mat work is a big component of the Pilates system and the goal is to move through each exercise one after the other focusing on memorization, flow, dynamics, tempo, rhythm and breath. What is a fully-equipped Pilates studio? When Joseph Pilates founded his method, he developed the exercises right along with the equipment. In a fully-equipped studio you will find the reformer, cadillac, ladder barrel, wunda chair, electric chair, spine correctors, and more. Gratz equipment is the original manufacturer of Pilates apparatus. Gratz equipment works the muscle and gets into your body like no other equipment can. It is designed to work with you and challenge you. Authentic Pilates Stillwater uses only Gratz equipment. In order to get maximum results you should commit yourself to three sessions per week. Doing less is still going to be beneficial. One should always remember that consistency is the key to reaching your goals. Joseph Pilates said that, "You will feel better in ten sessions, look better in twenty sessions, and have a completely new body in thirty sessions." If I am pregnant, can I do Pilates? Only if you have been doing Pilates on a regular basis for at least six months to a year before conception. With the approval of your physician, Pilates is a wonderful way to keep in shape and prepare yourself for delivery. Do I need to be in shape to start doing Pilates? There is no physical pre-requiste to benefiting from Pilates - come as you are! I just had a baby and would like to start doing Pilates. How long do I have to wait after birth? Always consult your physician before beginning an exercise routine after giving birth. Once you have the ok, call to make an appointment.